Liesl tips off Michael about Hayden. Jason tells Sam that she&apos;s doing well enough to be released soon. Sam doesn&apos;t like pretending that she didn&apos;t shoot Sonny, despite Jason&apos;s feelings on the matter. Sam mentions her talk with Julian. She thinks he knows the truth. Sam mentions throwing the gun into the dumpster and worries that the police have found it. Jason&apos;s heading out, but makes her promise not to confess anything to anyone. Scott explains to Julian that his trial is in recess. He thinks the DA is stalling while he tries to get Jason on the stand to testify. Michael stops by to grill Sonny on who really shot him in the leg since it wasn&apos;t Garvey. Michael thinks someone got spooked about Sonny leaving the business and sent a contractor to shoot him. Michael doesn&apos;t want Sonny to retaliate. Sonny swears that he won&apos;t.
Police find a third gun in the dumpster at the construction site. Dante orders a forensic test on it. It comes back positive as the gun that shot Sonny in the leg. The Quartermaine mansion prepares for Hayden and Finn&apos;s wedding. Monica&apos;s upset that cook quit and is even angrier when Olivia admits she fired cook because of her poor attitude. Monica wants Olivia to apologize and hire cook back in time to prepare the wedding feast, but Olivia disagrees. Monica is not happy with Olivia. Jared&apos;s happy that he&apos;s going to get all of his money, which he feels Hayden owed him. Liesl says her target is Finn and that she plans on ruining his life. Curtis is ready for the wedding, but Finn&apos;s upset. He explains about Hayden embezzling the money for Jared. Curtis says he told Hayden to tell Finn the truth. Finn explains how Hayden walked out on him. Curtis tells him he needs to fix it. Alexis stops by to see Sam. She talks about Julian&apos;s trial and how she told the truth. Sam is upset about the things that she did when she was sick and how she hid it. Alexis tells her that it was the disease and to move on. Liesl anonymously calls Michael. She tells him about Hayden&apos;s suspicious activity and as a board member he needs to check into it. Michael looks into. He heads to the mansion to let Monica know that Hayden embezzled money under her previous name, but then reversed it. Liz senses something is off, but Michael says it&apos;s about the board. Liz tells him about the call from the bank that upset Hayden and wonders if her sister is in trouble. Jason goes to see Julian to find out exactly what was said in his conversation with Sam. Julian explains, then tells Jason about Sam&apos;s visit with Ava. Jason tells him to stay away from Sam. Dante and Nathan update Sonny. They mention they found the third gun, which is untraceable and wiped clean. Sonny swears he has no memory of anything after Garvey shot him in the vest. Finn and Curtis get to the mansion. Finn is desperate to talk to Hayden, but Liz says she&apos;s getting her hair done for the wedding. Curtis calls Hayden&apos;s number, which has been disconnected. Liz checks upstairs. She then tells everyone that Hayden and her things are gone, but she left behind her engagement ring. Jared checks for his money. He finds out that the account is closed and realizes that Hayden double crossed him. 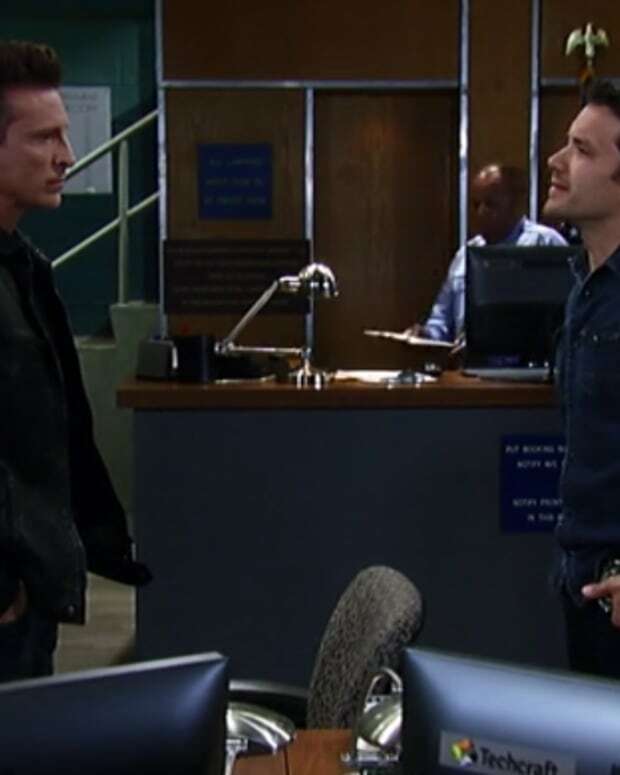 Jason goes to the station to talk to Jordan about Julian&apos;s trial. He overhears the officers mention that a third gun was found and that it&apos;s in the evidence room.